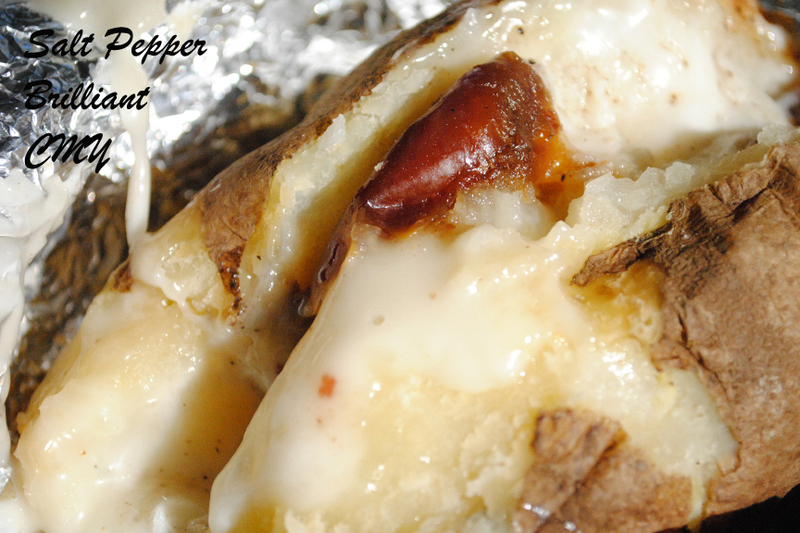 Giving the baked potato a seriously delicious makeover…yum! Ah, the baked potato in its sour cream and cheddar cheese topped glory. It is an American staple that is simply delicious, but what if you gave this quick lunch a makeover? One day I was craving a baked potato really badly. After seeing my father on my most recent visit have a baked potato every day for lunch I was really craving a spud. However, I wasn’t really in the mood for the same old baked potato toppings. I wanted something exciting; something to really make the culinary angels sing. So I grabbed my bag and set my sites on the grocery store. The second I arrive I make my way to the cheese case. Now when it comes to cheese I am not picky. I don’t discriminate against any of these dairy delights, but I wanted something I don’t usually stock in my kitchen. There it was a wheel of triple cream goat cheese brie, what a beauty. So what can I have with this brie? Honey would be nice, but I’m not really seeing honey in my baked potato future. Then it hits me, dates! They would be perfect for my delicious experiment. Now I only hoped this store carried dates, and to my complete and utter joy they did. Preheat your oven to 350 degrees F. Scrub and rinse your potatoes, leave the skins on. Prick your potatoes all over with a fork and wrap in foil. Bake your potatoes for one hour. Let them cool slightly then cut them lengthwise down the center without breaking the bottom skin. Season them lightly with salt and pepper. Now take a fork and stir up the flesh of the potato slightly. This will let all of the brie melt into all of the crevices. Add as much cheese as you like, and then add the dates. I leave them whole but you can chop them if you like. Close the potato around your filling and rewrap in the foil and place back into the oven until the cheese melts. I usually leave it in for about ten minutes. When finished unwrap and enjoy.